You might think that bed bug bites are the worst thing that can happen when you have a bed bug infestation in your home, but there are other--more dangerous--risks to your health from having bed bugs living with you. Although bed bugs themselves do not carry disease, unlike mosquitos and some other biting insects, their bites can result in allergic reactions and be a route to potentially deadly infections. 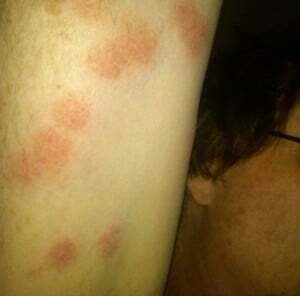 Read about a man in Tennessee who ended up with a life-threatening staph infection HERE. We read in today's Huffington Post: "new studies warn of the potential subtle or long-term consequences of exposures to bedbug pesticides, including hormone disruption, reproductive difficulties and behavioral problems." But those are not the only risks from using pesticides at home. The anxiety caused by a bed bug infestation can make people do crazy things, including spraying bug-killer in their beds or on other furniture or even--scariest of all--on their own bodies. At Alliance, we are strong proponents of using heat to kill bed bugs. In fact, we use Thermapureheat treatment to kill bed bugs all over California every day. But we are pest control professionals. We do NOT recommend people trying to heat their homes up to the 120 degrees that it takes to kill bedbugs on their own. At Alliance, we have specialized equipment to raise interior temperatures high enough to kill bed bugs at every stage of development, but using space heaters, steamers or other home appliances to try to do the same thing could result in heat damage to possessions, burns or even home fires. We understand the impulse to try to take care of bed bugs yourself. People don't want to talk about their bed bug problems--they are embarrassed or think bed bugs reflect on their housekeeping or hygiene. But the only sure way to get rid of bed bugs in one treatment is to hire a professional. If you have a bed bug infestation anywhere in California, contact Alliance Environmental Group. Call, email or even chat with a professional on our website. Our highly trained teams are experienced treating areas, rooms and entire structures in one treatment, with no dangerous chemical pesticides. We are here to put your mind at ease and let you get some sleep!